We often have visitors to our website call us with questions about size or weight descriptions of our jewelry, especially earrings. For instance, if you see a hoop earring specified as 18mm in length, what does that really look like? Pictures of jewelry on our website, and other websites, are never "actual size". This is because the image will be seen on many different types of displays--tablets, laptops, cell phones, and desktop computers. Each of these devices will render the image at a different size. In addition, if the item was displayed as actual size, the viewer would not be able to see important details in it's construction. Even if a measuring rule is superimposed over the image, the rule will not be actual size, and visualization is still difficult. Item weight is also important for all jewelry items, because the cost and value is proportional to the weight of precious metal. But, on some items, such as earrings, weight is also critical because a heavy item could be uncomfortable. In the past, we have dropped some hoop earrings from our website for this reason, because customers would return them, saying they were uncomfortably heavy for their pierced ears. To assist our customers visualizing jewelry sizes, we have recently added a helper page with a size and weight comparison between seven different U.S. coins, ranging in diameter from 17.9mm to 38.1mm, and in weight from 2.67 grams to 22.68 grams. So, using this information, you would determine that a 3mm-wide wedding band is approximately the width of a stack of two pennies. 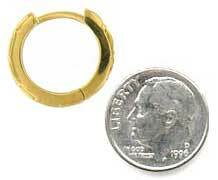 Or, as illustrated above, an 18mm hoop earring is about the same diameter as a dime. If the earring is specified as 2.5mm wide, then you know it is slightly less than the thickness of two dimes. Regardless of how much information we give our customers on our website, we realize that there is no substitute for actually holding the jewelry item in your hand! That is why we allow a 30-day return for most items (see our Customer Service Page for details). Remember, after looking at websites and zooming in on jewelry pictures, your brain could be programmed to expect a larger size piece than it actually is, so use our information to help you accurately gauge jewelry size and weight prior to ordering.